“In the Navy:” Eclipse 04 features navy gradient tint lenses in a black metal hood with a hand-polished tungsten rim. Lenses feature backside anti-reflective coating and nose pads are hypoallergenic. Polished black acetate temples are inlaid with pewter saffiano leather. Our finest craftsmanship: Eclipse is a metal and acetate combination frame that flatters any face. We set out to create the perfect round sunglasses using only the finest materials and best craftsmanship. Each frame is meticulously handmade in Japan and features high-quality shatterproof lenses with 100% UV protection. 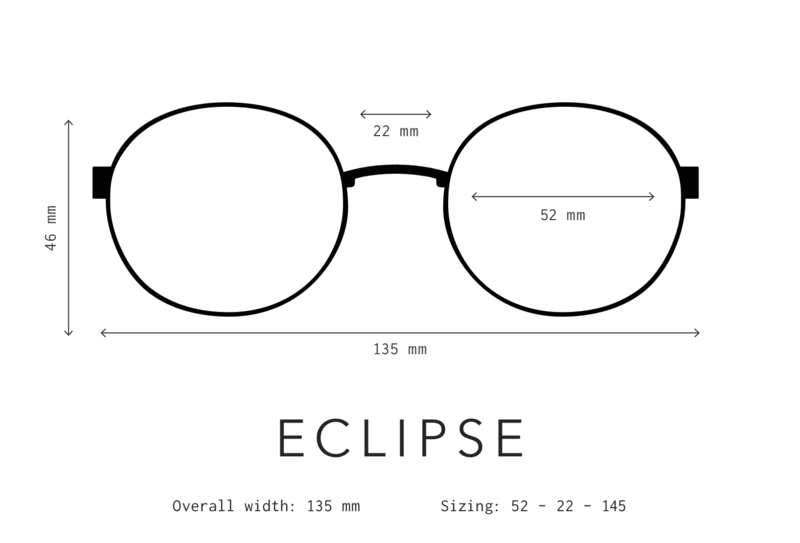 The Eclipse shape was designed to be comfortable and flattering on all face shapes. Its wire-core temples are highly adjustable, and its super-durable surgical-grade stainless-steel construction and smooth, high-quality hinges ensure these will be your favorite shades for years to come. Inspired by the sublime beauty of a solar eclipse, we set out to create a truly awe-inspiring frame. Eclipse features our finest craftsmanship; its hand-finished metal hood literally “eclipses” the lens, emphasizing the depth of the frame. The polished rim ensures you will always shine bright.